Summary : This is a unique and high quality whole fruit herbal tea from Culinary Teas. This is a tea for berry lovers, particularly those who enjoy a rather sweet and quite tart and bold taste. I found no particular berry flavor stood out...instead, this tea provides an interesting flavor from a wide range of various berries, leading to a very unique if somewhat strong taste. Review : Well, here it is...January. Still a long ways towards spring, even here in sunny Nevada. And with a winter storm about to hit the Sierras tonight, putting snow down on the valley floors of Nevada, I was in the mood for a "spring time" tea...or a tea that would remind me of the warmer weather yet to come. And so I ventured to my ever growing assortments of teas and rummaged through what I had. And found deep down in the box was a tea sampler I picked up from Culinary Teas called Berry Berry Herbal Tea. Berries...I like that...as it says "spring time" all over it. This tea contains the following ingredients : "Hibiscus petals, Rosehip chips, Raisins, Dried black currants, Dried red currants, Natural Flavors." Here is how Culinary Teas describes this tea on their website : "Herb and fruit tea; in some circles is considered a new type of tea. We formulated this blend to accommodate tastes of people who wanted to experience a refreshing healthy new style drink without caffeine. What we got was a terrific ‘tea’ that is unbelievably delicious and enjoyed Hot or Cold!" Additionally, Culinary Teas further says about this tea " The hibiscus adds a tart dimension to the blend which makes it very refreshing. The rosehip chips add a mellow smoothness to the tea along with Vitamin C. The currants give the tea a very distinctive character - black for fruitiness and red currants for ‘bite’ and tangy flavor. Finally, we added raisins to give a natural sweetness and topped this off with natural flavors to further enhance the delightful character of this tea." This tea, probably not surprisingly, has a very strong berry aroma right out of the foil bag that this tea comes packaged in. And the tea pieces, well, they are quite large...although not quite as large as other whole fruit teas I've tried. Still, large pieces are always a good sign, so in a happy frame of mind I went off and brewed this tea. So what about the taste of the tea? Do you really need me to say...it tasted like a berry tea of course! 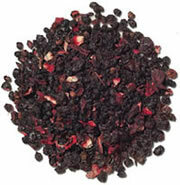 This tea simply has "berry" all over it, both in aroma, flavor and even in the dark maroon color the tea has once brewed. Now, word of warning here, the flavor is strong. Very strong. And also rather tart. If you are looking for a subtle tea, well, this one definitely is not for you. Instead, this tea is for berry lovers, people who love eating raw berries and enjoy the rather tart and somewhat bitter flavor most berries have "straight off the vine." Overall, if you enjoy fruit herbal teas, you'll like this one. Just be prepared for a very strong flavor...as this tea holds nothing back. Additionally, while I havne't tried this tea iced yet, it does not take a rocket scientist to see that this tea probably would make for a superb summer iced-tea. Recommendation : Yes. If you love berries, and in particular whole fruit teas, you'll definitely enoy this rather sweet and very tart tasting tea. I personally found this tea to be almost too "tart" for my tastes, yet I still liked it. Brewing Instructions : Pour 6-7 ounces of boiling water over tea pieces. Let steep for 5-7 minutes. You'll want to use 1.5 to 2 teaspoons of leaves for each cup of tea.